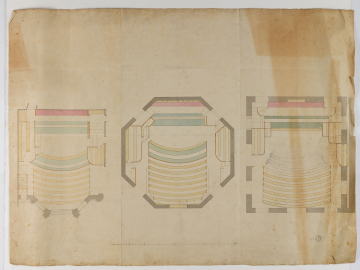 In the plan for the Court of King's Bench as accommodated within the New Law Courts (shown on the right-hans side of the sheet) the first two tiers of seating are indidated in pencil, suggesting the exact arrangment of this element of the furnishings was still under consideration. All three plans demonstrate the comparative capacities of the three different locations of the Court of King's Bench. That this drawing remains untitled and without annotations suggests it was never presented for discussion. The coloured washes to demark the seating within the Courts tallies with SM P 281-iv/a and SM P 281-iv/b.